that was used at a log dump in Cathlamet, Washington. 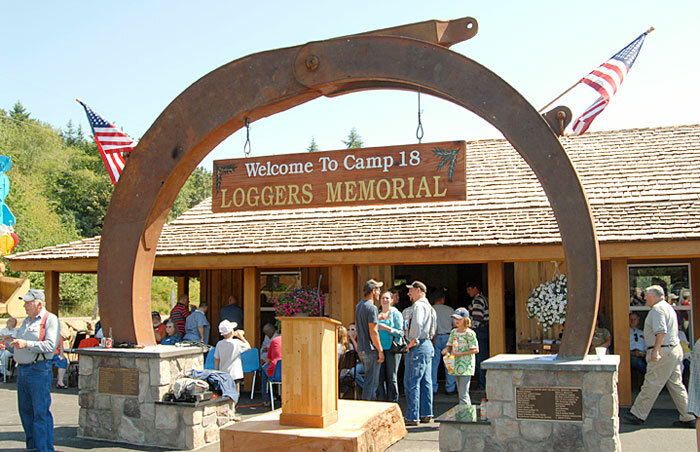 Thanks to a long list of generous in-kind and financial sponsors starting with Gordon Smith, the owner of Camp 18, the Loggers’ Memorial at the Camp 18 Restaurant and Logging Museum is mostly completed and now open. Project coordinator Mark Standley donated many hours of his own time to push the Memorial through to completion and the result is stunning. For a complete list of those who contributed to the project, click here. Housed in a purpose-built structure on the Camp 18 Museum property, the memorial is just a stone’s throw from the restaurant. The Memorial is in a beautiful setting befitting those whose dedication to our forests, and the raw materials needed by a growing populace, will forever be enshrined. This is an opportunity for families and friends to memorialize individuals from the past, present or in the future who’ve made logging their work, their passion or their life. 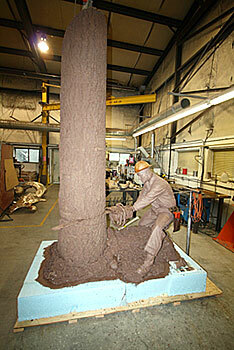 Artist Steve Parks of Parks Bronze, Enterprise, OR, 541-426-4595 ( www.parksbronze.com ) was commissioned to craft the bronze statue, depicting a logger at work felling a tree, as the centerpiece for the Memorial. The bronze was unveiled at the dedication ceremony August 30, 2009. Viewer comments during the dedication were overwhelmingly positive. Flanking the statue are four huge slabs of Douglas Fir lumber. These slabs are the display locations for the bronze plaques that commemorate those who worked in the woods or the wood products industry. 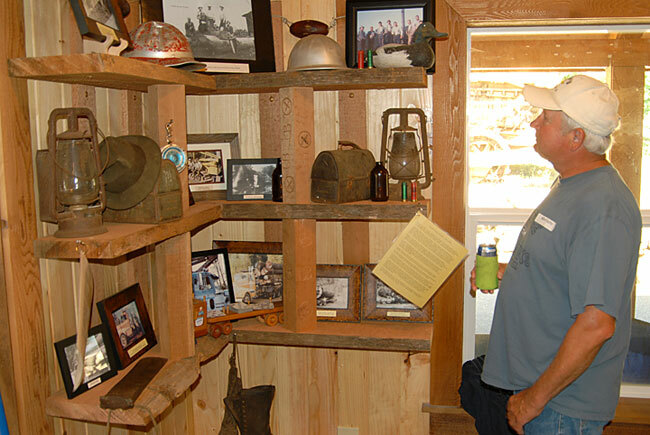 The overhead light fixtures are locally hand crafted from old-style “tin hat” metal safety helmets, and featured on the walls are a few displays of hardware and other logging memorabilia. a sign on the door directs you “If closed, go to the gift shop” and they’ll arrange for you to see the facility. Although the memorial is essentially complete, it remains, by its nature, a work in progress. Memorial cast-bronze plaques are available for $150 each. These plaques can hold up to four lines of text, and you can find a .pdf file of the application form by clicking here or phone Danielle Cook at the number shown below. We also have a limited amount of wall space to display historic or otherwise memorable items from local loggers. If you have something that you’d like to have considered for display in addition to a bronze memorial plaque, contact Mark Standley at the number shown below. We can’t guarantee we can fit everything in, but we’d like to discuss it with you. It’s almost a given that any project involving loggers will also involve stories -- LOTS of stories! Some are true, and most are really interesting. To make those stories accessible we’re working on a searchable database of stories, anecdotes and personal histories of the men and women whose names appear on the plaques. When complete you’ll be able to search the database, using an on site or home computer, for information based on the loggers’ name, company, and so on. At present we have no estimate on when this part of the memorial will be finished. For more information on the Memorial, the plaques or to make a donation to the Loggers’ Memorial, contact Mark Standley at 503-434-0148, or Danielle Cook, 503-308-3250. 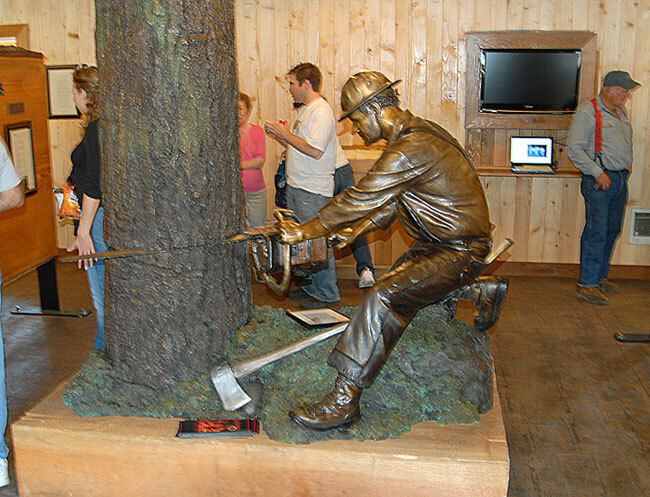 The Camp 18 Museum and Loggers’ Memorial are a 501-(c)(3) organization. 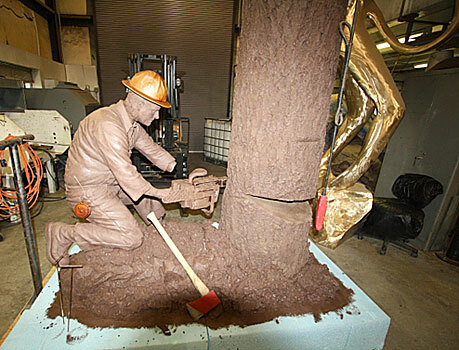 A classy bronze statue depicting a logger hard at work is the centerpiece of the Memorial building. The statue was done by Parks Bronze of Enterprise, Oregon. 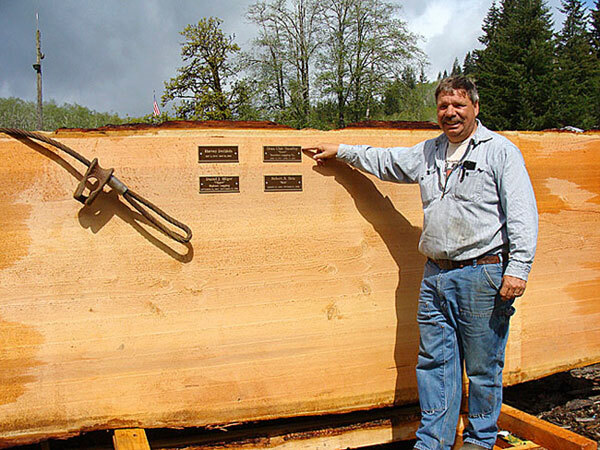 Four Giant Douglas Fir slabs are poised to display the bronze memorial plaques. 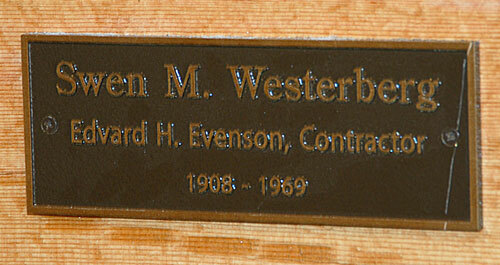 Each cast-bronze memorial plaque measures 3 x 8 inches and can accommodate four lines of text. The Memorial also includes some memorabilia associated with some of the people whose names are on display. Limited wall space inside the building restricts how much of this type of material can be included. With Our All New Camp 18 Logging Museum Licence Plate Frames! New! 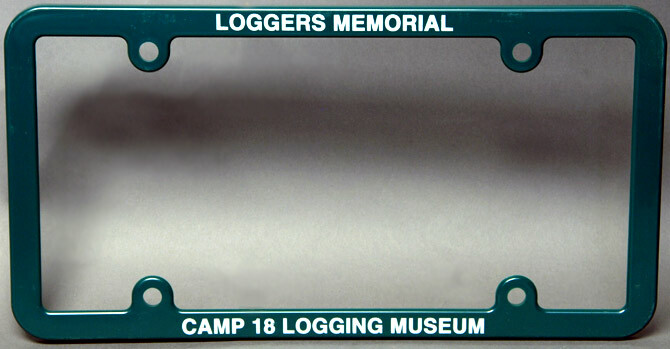 Promotional license plate frames for the Camp 18 Logging Museum and Loggers' Memorial. These plastic frames are designed to bolt directly to your license plate and permit full legal visibility of the lower-corner date tags. 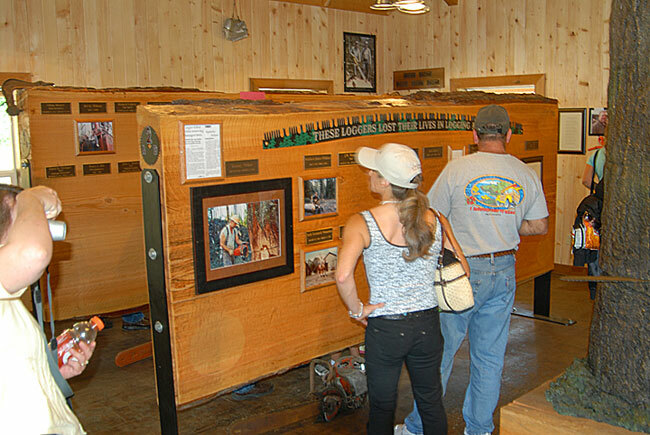 Your purchase of these frames helps support the ongoing historic artifact and display recreation activities at the Camp 18 Logging Museum and Loggers' Memorial in Elsie, Oregon. The frames are available in the gift shop at Camp 18, or you can purchase them online for $10 per set, at TrainVideosAndParts.com. Following is a list of contributors whose generosity helped make the Loggers’ Memorial a reality. Although we tried to make this list as complete and accurate as possible, there will be misspellings and omissions. Please e-mail us with any additions or corrections.